Growing up with both parents from South Carolina meant we ate real soul food – real Southern cooking. One of the things my parents made that I especially loved were Salmon Croquettes. They were quick, easy, and of course, yummy! The other night, when I was not in the mood to do anything, let alone cook, I’d remembered my mom had given me some salmon (in the can). I decided to make some salmon croquettes. Listen, I haven’t made these things since my husband and I first began dating, which is almost 6 years ago. Therefore, my salmon croquette making skills were a little dusty. Plus, we were all out of bread crumbs or panko, so I had to improvise. Although I didn’t use fresh salmon, and didn’t use bread crumbs, my salmon croquettes were amazing! I’m not just hyping up myself. I posted a photo of the finished product and was asked to provide the recipe. Keep reading for my salmon croquette recipe, and try it out for yourself. 1. Break salmon into pieces in a large bowl. Add the remaining Old Bay and salt along with the bread crumbs, butter, scallions, onions, eggs, and lemon juice. Stir ingredients until just combined. 2. Spoon 1 tbsp of the mixture into your hand, and roll into a ball. Then, flatten into a patty. Place on patty on parchment paper until you’re completed with making all of the patties. 3. Add oil to a 12″ cast-iron skillet until it reaches a depth of 1/2″. Heat over medium-high heat until oil registers 325° on a deep-fry thermometer. 4. 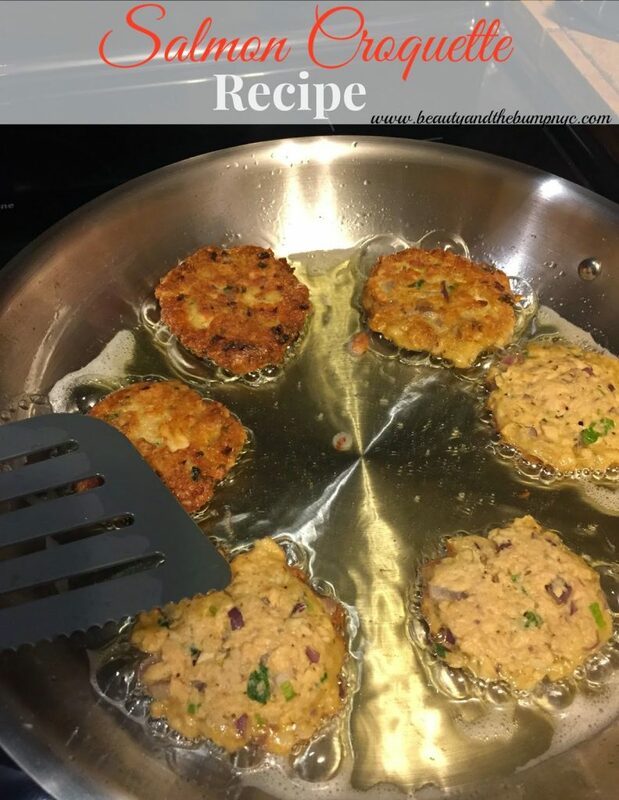 Using a metal spatula, gently transfer half of the patties to skillet and cook, flipping once with the spatula, until golden brown, about 5 minutes. 5. Transfer croquettes to a paper towel–lined plate and repeat with remaining patties.